The video begins with five officers standing over Michael Fox, pushing him down to the ground as fights rage around them. To the left of the screen, his brother, John Fox, pushes at officers, trying to get them to back away. They close in tighter. The video, along with another one shot at about the same time, goes in all different directions as it captures the events that took place inside La Bamba nightclub in Salisbury during a night of chaos in 2009. Security guards and police officers struggle to maintain control of a crowd that seems to be breaking into fights at random everywhere. Patrons slip on what appears to be Michael Fox's blood as he lies face down, handcuffed. Through it all, Kareem Puranda, then a uniformed officer with the Salisbury Police Department, can be seen bouncing around the room, getting involved in different altercations. About three and a half minutes into the video, he finds himself face to face with John Fox again, this time without a team of officers at his side. After a few words, Puranda swings. The punch is not the move of a police officer trying to subdue what he perceives to be a viable threat. It's the move of a kid raised on the streets, grown up but still lashing out at something he fears. It was just one of multiple times that Puranda would be accused of excessive force, each time being found innocent of criminal charges but costing the city tens of thousands of dollars in settlements. As Puranda looks back at that incident, he recognizes that he was lashing out at more than just a man twice his size. He attributes his behavior to PTSD that began during his childhood in Bronx, New York, and was cultivated when he went through Basic Law Enforcement Training. Since leaving the police force in 2010, Puranda has focused on how PTSD, burnout and other psychological issues are allowed to silently run rampant in police departments nationally. He now hopes to confront those issues. 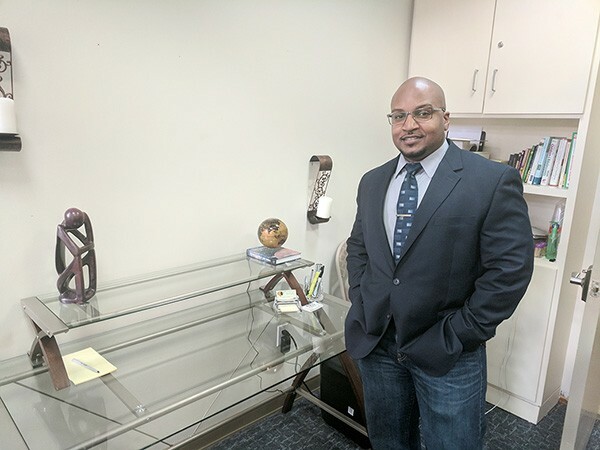 In June, Puranda launched Self Talk Counseling & Consulting, a firm that hopes to work with police officers to address the biases and psychological issues that can lead to excessive aggression in the field. 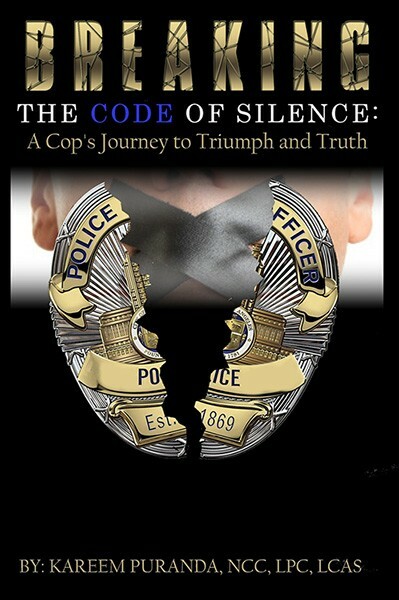 In November, he published Breaking the Code of Silence: A Cop's Journey to Triumph and Truth, a book that lays out the reasons he believes psychological counseling should be mandatory for police officers from training through retirement. We visited Puranda's east Charlotte office recently to talk about his experiences in law enforcement and why he should be the one to lead a movement for a more stable police force. Creative Loafing: What did you think about police before joining the Salisbury Police Department? Kareem Puranda: Growing up, initially I had this imagination. I looked at the good guys versus the bad guys. The Autobots versus the Decepticons. G.I. Joe versus Cobra. He-Man versus Skeletor. Seeing how they were victorious persuaded my impressionable mind at a young age that I wanted to be a good guy. Growing up in New York, I lived somewhat of a sheltered life, attributed to my mom's concern for my safety, so I didn't really get much exposure to the environment. A lot of the challenges that existed in my neighborhood, as it relates to the relationships between police officers and the community, I wasn't privy to until I had an experience in middle school where I was walking home and I blurted out to a police officer who was sitting in his cruiser near where I lived, "One day that's going to be my car." I'm not sure if he heard what I said, but he was very angry. He gave me an angry response about whatever statement he thought I made. From that point on I didn't really like police officers, so it wasn't something that was on my radar, but it was something that I grew into after meeting the chief of police in Salisbury [while attending Livingstone College]. What do you think led to the issues you faced as a police officer? I think it has everything to do with the totality of one's human experience, from childhood up until and throughout adulthood. We are constantly evolving, constantly encountering experiences that shape our perception of the world around us. Personally, my transition into law enforcement was easy because the hyper-vigilance that you develop as a police officer throughout the training was something I had already practiced in my neighborhood growing up in The Bronx. I was looking over my shoulder, I was always concerned about who was going to rob me or who was going to try to do something villainous. It's the same mentality in law enforcement: everyone's a suspect. In BLET, they train you to identify the bad guy. He doesn't look like any particular individual, but he is identified by behaviors. He runs. He's noncompliant. He conceals his hands. He doesn't make the transaction with law enforcement smooth, and these are the individuals that you need to be mindful of. They carry guns and drugs and they do criminal things. What happens is that condition that occurs in BLET is what the officer marries himself to. Then in the mainstream media, you have different genres of music that subscribe these behaviors to a certain population, which makes the young African Americans the usual suspects. There's a "trap music" culture that embodies the behaviors that officers are trained to address, and these narratives, they clash. What experiences stick with you from your time as a police officer, good or bad? I would say it was a good and bad experience all in one; in fact, those situations that earned me lawsuits, where I was able to challenge the ego that I was operating by — that in one point in time in my life kept me safe in my natural environment. It was that same ego that created the conditions for me to encounter lawsuits and the indictments that I ended up experiencing at the end of my career. I say it's good and bad because that condition created an awareness within me to write this book, to start my own private practice in counseling and to go back to school to become a counselor to learn more about the conditions behind the psychology; to learn why people do what they do. I was at a loss. I did not know. I wasn't privy to the diagnoses or the criteria for burnout. I didn't know I was dealing with burnout during my time as a police officer, and I was afraid to ask because the culture of law enforcement doesn't give one permission to do so. What made you want to look at it from that psychological perspective? I didn't start law enforcement the way that I ended it, and that was the concern. That's what triggered the investigation from my own personal introspective, which is why I wrote this book and utilized my life as a case study to highlight the transition from the neighborhood I grew up in, which I believe induced PTSD at one point in time in my life, and it followed me all the way through my law enforcement career as a normalized thing, not something that was abnormal. And I wasn't privy to it, again, because I didn't see it as something that I needed help for, until these events started happening and it caused me to question why. What do you say to those who don't believe it's justified for you to be helping officers as someone who faced so many problems on the force yourself? I had an awakening moment. It's usually out of adversity that the lessons come, or that an awakening type of experience comes. It took those lemons for me to make lemonade, if you will. I don't think I would have tapped into this understanding or this courage that's required to address this scenario in law enforcement culture had it not been for those circumstances. Those circumstances were actually necessary, in my opinion, for my journey. How would you describe burnout, as someone who's gone through it? Some of the byproducts of burnout are cynicism, apathy, low energy, just a hopeless or helpless feeling, even while you're trying to do the job. You just show up to go back home — you're really retired on duty, if you will. There's no motivation. That was pervasive throughout the department that I worked for and even in other departments, with people that I knew that worked in other agencies, it was the same type of low morale. There was no help for the officer. And is that something you continue to see in your counseling work today? Absolutely. Officers are struggling inside and there's no permission given to provide them the avenue to get help, because of the concern that they'll be classified unfit for duty and it will compromise their job security. There's an incident in Eatonville, Florida, going on right now, where an officer has been given a resignation date of December 31 because of his PTSD diagnosis. He was an officer who rescued someone from the Pulse nightclub shooting, and he is now being requested to resign because of the diagnosis. Now, he wasn't the only officer on scene, but he's the only one confessing PTSD, and now he's no longer fit for duty. So it sort of comes across as a punitive thing to seek help. One of the things that I propose in my book is that counseling should be mandated throughout an officer's training, his career, and even post-law enforcement career through his retirement because of the stress — the high, chronic, layered stress that officers deal with. That Florida officer, Omar Delgado, is in an unfortunate situation, because he didn't do anything wrong, but couldn't keeping officers who are known to be struggling with PTSD pose a danger to our communities? One option is administrative duties. I believe he's advocated for being placed on a desk job because he had about six months until he's vested for 10 years. He can do things around the police department in a complementing role; evidence or other areas of the department. As it relates to PTSD, there are varying levels of it, and everyone who is exposed to a traumatic incident isn't necessarily impacted in a PTSD type of way. However, counseling is in fact able and capable of helping people become officers, become fit for duty again, when you process the events and recognize, as you said, the idea that this incident was no fault of his own. He was tasked with a job to go in there and do what he was paid to do and he did that. So it's a matter of processing with that particular individual, understanding his path to where he is today and how psychological triggers are formed in his own unique mind so that they can be addressed. Beyond fear of losing their jobs, police officers aren't known to be open to speaking out about on-the-job issues, even in a private counseling office. How do you break through that "Code of Silence" that you refer to in your book title? It's ultimately trust. Being able to recognize that working with me, independently of the department, is not going to backfire on them. I think ultimately officers fear being able to disclose some of the challenges that they face on the job because it may get back to their superiors, who will question their ability to do the job. The reality is that we all, as human beings, have challenges that we face, and we all deal with these challenges remarkably differently. The standard that officers are held to in terms of their integrity is a standard of, "You should be able to handle seeing a dead body, you should be able to handle all the grim stuff that average citizens don't want to deal with." The reality is that they are human beings, like everyone else. The uniform itself carries no power once that officer wears it. You've done outreach with community members, as well as your work with police, right? I started a nonprofit back in 2012 called Achieving Success on Purpose, and what I do through that organization is I educate children from lower sector populations. Currently I've been working out of the Naomi Drenan Rec Center, and I do free chess lessons over there to educate children on the concepts of applying chess to real life; being calculated in how you make decisions as well as developing social and emotional intelligence with the other children who are participating in the program. I've been doing that since 2012, and I'm also trying to kick-start a robotics club, introducing children in those areas to things that are outside of their current scope or reach. In what ways do you see connections, if any, between officers and community members on extreme sides of the spectrum, meaning residents who dislike police or officers who have shown a clear bias? The fear-based concept is, in fact, what I believe is induced in BLET. Officers are exposed to videos with shock value, shoot-or-be-shot scenarios, and these scenarios are designed to put the officer in a fight, flight or freeze moment, and to condition the officer to go into a default to survive the fight with the bad guy or make a calculated decision during that high-stress moment. Neuroscience tells us that making a calculated decision in a high-stress moment is not possible; you're going to go to an impulsive default. And so law enforcement conditions an officer to address the threat with a "double tap," which is two shots to the midsection, the large part of the body, to disable the threat. That impulsive conditioning designates an "us versus them" mentality, especially in the shock value videos when someone walks up and unexpectedly kills an officer while they're trying to do their job. Then it does become an us versus them. In the community — their perspective going back to the 1960s with Bull Connor down there in Alabama siccing dogs and water hoses on African American protesters — it's a stain, it's an imprint, a traumatic imprint through generations that law enforcement can't be trusted because: Look at how they've treated our people. So the people in the community don't have issues, per se, with the officer as an individual, but they have issues with the badge and uniform. And that's what creates the adversarial stance. It's a condition that's created by the historical narratives of the country and the training and the videos and what's perpetuated underneath that. I've seen you criticize the media's role in that narrative, but it's important to report on cases like the shooting death of Walter Scott, for example, for which former officer Michael Slager was just sentenced. He might not have faced justice if the media had not shared that video. From my personal experience, after I went through my ordeal in 2009, I saw how that circumstance was reported versus what really occurred. What I took away from it was that the media tends to take a half a truth and present it in such a way that makes one assume that it's the entire truth. When the brain reads something, if there's information missing, the brain wants to create the complete sentence without the information being there. I think the media does an interesting job of being able to present a half-truth, and then that blank space is what's left to question, and based upon the tone of the article, it will go in that direction. I remember going to trial and being able to testify and that being the most exhilarating thing that I was able to do, because I was finally able to tell my side of the story. I was vindicated because I was able to articulate what actually happened. I had to sit on that for years before I was able to actually do that. That was painful for me, because the whole story wasn't being disclosed, and people were judging me based upon that half-truth. What do you ultimately hope to accomplish with this book? My main agenda for writing the book is to create a conversation about the necessity for counseling to be instituted in law enforcement training — throughout a law enforcement officer's career as a mandated program and also even for officers when they retire — to change the perception of a tool that can help. Because right now it's looked upon as something that will, in fact, compromise their ability to work, so officers shun it when it's a tool that can help. Officers are mandated to go to counseling or see a psychologist following a critical incident or event such as a shooting. They have that in place and that's a great thing, but what about those officers who are struggling silently with the burnout — with the progression of burnout that BLET doesn't prepare them for? How do they get help?